You can reveal this card in your hand; your opponent randomly chooses 1 card from your entire hand, then you discard the chosen card. Then, if the discarded card was not "Danger!? Tsuchinoko? ", Special Summon 1 "Danger!? Tsuchinoko?" from your hand, and if you do, draw 1 card. 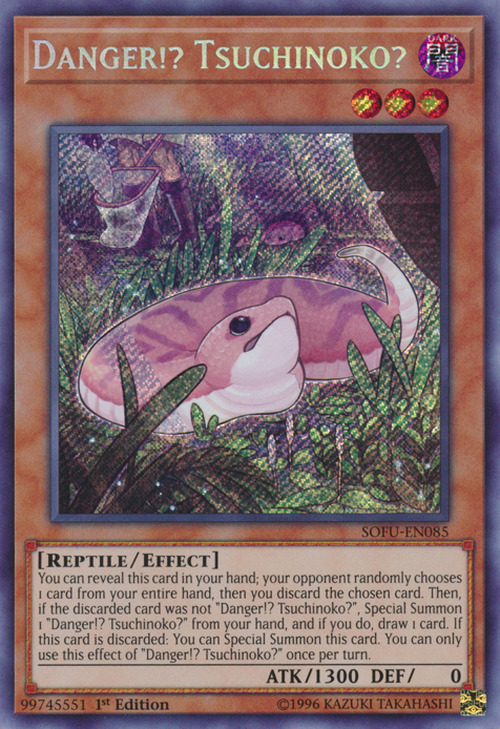 If this card is discarded: You can Special Summon this card. You can only use this effect of "Danger!? Tsuchinoko?" once per turn. This card is based off of the cryptid Tsuchinoko of Japanese legend. In Japanese folklore, the Tsuchinoko (ツチノコ or 槌の子), literally translating to child of hammer or child of dirt, is a snake-like being. The name tsuchinoko is prevalent in Western Japan, including Kansai and Shikoku; the creature is known as bachi hebi (バチヘビ) in Northeastern Japan. Two other monsters based on this same cryptid are “Sinister Serpent” and “Terrene Toothed Tsuchinoko”.